Katrina Gougis and A&K have been an outstanding business partner for myself and STX. Katrina is a top-notch rail professional, who goes above and beyond to ensure all of our needs are met in a courteous and timely manner. Just recently, we were looking to place a large order for rail and OTM, Katrina found me the material, at a competitive price, and was able to meet our tight deadlines for delivery, allowing us to focus our energy on building the project. We appreciate the effort that Katrina expends towards STX’s ongoing requirements and look forward to continuing our solid partnership. I have worked on both coasts and my experience with both A&K groups has been that they are expedient, knowledgeable, professional and more than willing to do whatever it takes to try and assist us with whatever our needs may be. I have always found the sales staff of A & K to go out of their way to accommodate our needs. We feel that the pricing is great and the service is impeccable! "For many years now, A&K has provided an excellent level of service to RailWorks Track Systems - Gulf Coast Division. Whether it’s a single stick of rail, or 10,000 tons, Paul Theriot and John Boisdore have been there to deliver. They both take a personal interest in doing their very best to make sure our projects are successful, and that the material is delivered on time and per project specifications. You have a great team! Thank you so much!" "Dakota, Missouri Valley & Western Railroad has had the pleasure of doing business with A & K for many years. Throughout that time, A & K has consistently provided superior products, competitive pricing and has strived to meet all of our time requirements. I have found all of the staff at A & K to be knowledgeable and willing to provide valuable information when we require it. I appreciate the open communication with A & K to keep us up to date on the status of our orders. This information is critical to help us with scheduling and planning of our future and ongoing projects. Dakota, Missouri Valley & Wester Railroad has made the decision to use A & K as our key supplier. It’s a relationship that has been built over time and will remain that way for many years to come. In my role as a Purchasing Manager they simply “make my life easier”. I would highly recommend A & K to anyone, their service, quality and pricing is second to none." Dakota, Missouri Valley & Western Railroad has had the pleasure of doing business with A & K for many years. Throughout that time, A & K has consistently provided superior products, competitive pricing and has strived to meet all of our time requirements. I have found all of the staff at A & K to be knowledgeable and willing to provide valuable information when we require it. I appreciate the open communication with A & K to keep us up to date on the status of our orders. This information is critical to help us with scheduling and planning of our future and ongoing projects. Dakota, Missouri Valley & Wester Railroad has made the decision to use A & K as our key supplier. It’s a relationship that has been built over time and will remain that way for many years to come. In my role as a Purchasing Manager they simply “make my life easier”. I would highly recommend A & K to anyone, their service, quality and pricing is second to none. been very satisfied with the service. We look forward to our continued business in the future. " “A&K excels at customer service and provides innovative solutions to trackwork challenges." 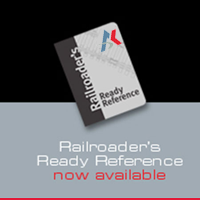 “The Gulf and Ohio Railways is pleased with the relationship that we have with A&K Railroad Materials. Ms. Gougis expertise in sales, service and supplying material on time to us is very valuable. We are looking to continue our long relationship with Ms. Gougis and A&K Railroad Materials." I’d like to thank you for helping us recover on the Mankato project. We know you could have told us to go pound sand and therefore we appreciate your willingness to lend us a hand. I’ll always remember that. "Beth, I just wanted to flip you a quick note letting you know how much we appreciate doing business with A&K. You and your team know what customer service is all about. A&K is number one when it comes to customer service and you are just downright a class act company. Thanks again!" "Katrina Gougis and A&K have been an outstanding business partner for myself and STX. Katrina is a top-notch rail professional, who goes above and beyond to ensure all of our needs are met in a courteous and timely manner. Just recently, we were looking to place a large order for rail and OTM, Katrina found me the material, at a competitive price, and was able to meet our tight deadlines for delivery, allowing us to focus our energy on building the project. We appreciate the effort that Katrina expends towards STX’s ongoing requirements and look forward to continuing our solid partnership." "Southern Railway of British Columbia Limited has been ordering track materials from A & K Railroad Materials since 2011. We are always provided with exceptional customer service, especially with our special track work orders that vary from the industry standards." I just thought I’d drop a note to let you know how much we appreciate you being there. Your quick service and convenient location has been an important asset for us. In today’s business environment, unplanned projects sometimes pop up and having key suppliers like A & K on hand to provide material with short notice really makes a difference for us. "Jordan Hopkin, Shantell Higbee, & Jeff Long, what a great team. They are always so helpful!" 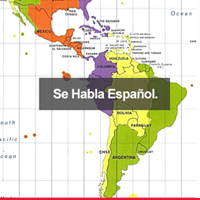 "The International Sales office headed by Mr. Alfredo Sansores, offers excellent customer service, products knowledge, quality products and timely shipment to all their customers worldwide. No matter how big or small the orders are they treat customers with the same courtesy and efficiency." Southern Railway of British Columbia Limited has been ordering track materials from A & K Railroad Materials since 2011. "I have worked on both coasts and my experience with both A&K groups has been that they are expedient, knowledgeable, professional and more than willing to do whatever it takes to try and assist us with whatever our needs may be." been very satisfied with the service. We look forward to our continued business in the future. I wanted to thank-you, Paulette, and Kurt for your continued high quality of customer service; your business performance leads to on time delivery. Your quality of interactions on the telephone definitely improves the reputation of A&K Railroad. I appreciate the technical assistance when I call and ask a question, either you, Kurt or Paulette will get back to me in a timely manner. I have worked in the Railroad Construction and Maintenance of Way Industry for over thirty five years. 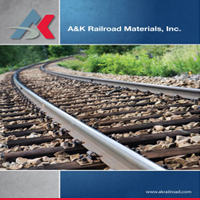 For many of these years I have been a customer of A&K Railroad Materials. The sales and the logistics teams, in Salt Lake City, along with the support of the Kansas City Facility have been a pleasure to do business with. Jeff Long and Jordan Hopkin are both honest, diligent, and professional. 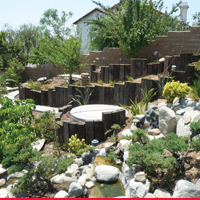 Their integrity, concern for the customer, and attention to detail, are unsurpassed. Jeff, Jordan, Shantell and the other members of the sales team not only deal with the normal, day-to-day items but continuously step up and go the extra mile in dealing with the, sometimes complicated, issues that are particular to this business. Lynn Kinsey and "the yard" crew are responsive and respectful to the our needs. They try to have our order "packed and ready". When one of our customers has a track outage, derailment, or other emergency, and Mountain States Contracting is required to respond immediately we take it for granted the A&K team will step up and assist us in getting the customer rolling again. Mountain States Contracting will continue to utilize A&K RR Materials as a Preferred Vendor and I, personally, am pleased to provide this Letter of Recommendation. “The service, sales, and material from A&K is great. They provide great material at fair market pricing. I am always sure when I place an order, the product is what they say it is and it is on time. Thank you A&K for the great service." Borates are one of the most effective and versatile wood preservative systems available today providing broad-spectrum efficacy and low acute mammalian toxicity. Using plugs treated with water solubles borates provides supplemental protection to a tie as the preservative diffuses in wet wood, moving from around the hole to cracks and exposed wood. The borate-infused wood becomes non-viable for insects and fungal decay, thus extending the service life of the tie. Notched, 5/8" x 4 1/2"
After nearly a year of construction, Kansas City has a new office building! The sleek and modern 13,000 square foot structure includes office space for Operations staff, Sales offices and Iron Highway Logistics. There is a nice reception area, conference room, two employee break rooms and plenty of parking. Besides being spacious and functional, the building is beautifully decorated with train themed art work and lots of greenery. A ribbon cutting ceremony and open house were held on November 14th. There was a huge turnout for the open house with many customers in attendance, vendors, Kansas City employees and A&K Sales personnel from all of our sales offices. Kevin Yoder, a representative from the office of Congressman Ethan Patterson also attended the open house. There was a catered buffet lunch from Fiorella’s Jack Stack BBQ and plant tours were given throughout the event. With so many employees in Kansas City for this event, other meetings were scheduled for our Sales group and Operations group. It was an exciting and productive event.